PLEASE NOTE: We have acquired this product from Rotten Leonard’s Jalopy Shop. We will be using the original tooling and same quality material to produce Bomber Style Seats. Do you have a cool set of wheels you have been wanting to use except the lug pattern doesn’t fit your vehicle? 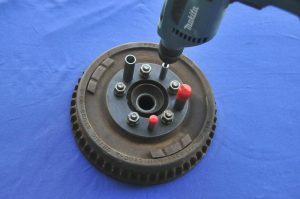 This handy drill guide will help you drill out both your axle and brake drum/rotor to a different bolt pattern that you need. This eliminates the need to find and change out two new axles and brake drums or rotors. We currently sell drill guides for 13 different lug combinations to meet most of the lug patterns and sizes available. What Is A Wheel Drill Jig For? A drill guide or “jig” is a nifty tool that you can use to re-drill axles and drums to be able to use a different lug pattern without having to remove the axles from the vehicle or take the wheels down to a machine shop to get re-drilled to the desired pattern. The drill guides are made of steel for strength, durability and can be used many times over. Our drill guides have 13 different lug patterns for the most common lug patterns and we can work with you if you need a custom size drill jig. How Do I Know What Size Drill Guide I Need? First you need to know what your current lug pattern measurements are. Bolt patterns are commonly reported as two numbers, the first number representing how many studs (lugs) are in the bolt pattern. Typically, a bolt pattern will have 4,5,6 or 8 lug studs or holes. The nest number is the diameter of the lug stud pattern. The lug studs are configured in a circular shape around the wheel hub center. If you draw an imaginary circle through the centers of all of the bolts in the pattern, then measure the diameter of that circle, you get the second important measurement. This number is commonly expressed in inches or millimeters. So if you had a pattern with 5 lugs and the diameter measured 4.5”, the number would be 5×4.5”. By far the most common lug pattern we see being changed is 5 lug. There is an easy way to measure the bolt circle diameter without having to figure out the exact circle. Since no 2 studs are straight across the circle from each other, you can’t just measure center of stud to center of stud. Instead, measure from the outside of one stud to the center of the stud that is closest to straight across the hub from it. This will give you a very close measurement of the actual bolt circle diameter for 5 lug patterns. First of all, you need to confirm that your axles and flanges are in the proper condition to be re-drilled. Make sure you inspect both of the axles for any obstructions, pre-existing holes or for thinning, worn spots or materials that could cause failure of the components. Keep in mind that you are responsible for making sure your axles are in good shape before re-drilling. If re-drilling weakens the components and leads to failure, it is your liability. If you have concerns, have a mechanical engineer inspect your parts before attempting to re-drill. The drill guide kit will include the drill guide and 2 brand new and very sharp drill bits. If you purchased a multi patterned jig, red plastic caps will be included to indicate the proper drilling pattern when in use. You will need the following additional tools: a low speed drill, cutting oil, and a torque wrench. Prep by removing the brake components. You do not have to remove the axle. Make sure all of the parts you will be working with are clean of any rust, debris or burs. Next, chase all of the threads of the existing wheel studs and nuts on both axles. After all of the parts have been thoroughly cleaned and examined, install the drill guide onto the studs as indicated on the guide. Put the lug nuts on, and using the torque wrench, torque to 20 ft-lbs in the typical star pattern. If you are using a multi-pattern drill guide, the red plastic caps included should be placed over the drill guide tubes you are NOT using to prevent from drilling the wrong pattern. Then the fun begins! Use the included ¼ inch drill bit in your low speed drill. Start by drilling through the small drill guide. During drilling, clear out the chips and use plenty of the cutting oil. After drilling the first ¼ inch hole, take off the jig and clean all components. Now index the jig so that the larger drill tube is right over the previously drilled ¼ inch pilot hole and then tighten down by reinstalling the nuts and again torquing them to 20 ft-lbs. Using the larger drill bit, go ahead and drill the hole to its larger and finished size. Again, use a low speed drill and copious amounts of cutting oil. If the bit overheats it can become dull and dull bits can cause the holes to be drilled off center. Keep the bits lubricated! After you are finished drilling the larger, finished hole, remove the jig, clean off the components and begin the process again until all holes have been drilled. Keep in mind-the new wheel studs will need to be replaced with a stud that has a .625” knurled shoulder. Many are available in different thread sizes and lengths. Most parts stores have an easy chart of finding the size you will need. Press out the old studs and install the new ones. You can now reassemble the brake parts and put on your new wheels! Our drill guides were acquired from Rotten Leonard’s Jalopy Shop. We use the original tooling and the same quality materials to produce these drill guides. These drill guides have drill guide “tubes” to precisely guide the drill and bit to the exact location you want to drill. It is a unique feature you may not find on other drill jigs. If you have any other questions, let us know!